There’s a reason I decided to kick off Deep Groove Mono’s Jazz Collectors of Instagram series with @jrock1675. Namely, when it comes to the “holy grails” of our hobby as suggested here on Deep Groove Mono, he has just about all of them. I considered naming them here to give readers a sense of just how prestigious his collection is, but it really is just about every one of them. But before you get too envious, consider that jrock1675 has been collecting for over two decades, and our electronic exchanges have made it clear that he’s a humble, cool dude. I think we all have something to learn from such a decorated collector, and the following exclusive interview gives some insight into his collecting story. DGM: How long have you been collecting records and jazz records specifically? jrock1675: I’ve been “collecting” records from the time that I was a child, but did not really care for them in a way that would allow them to stand up to many repeat listenings! These were mostly 45s geared towards children. I started to truly collect jazz records in the late ’90s. 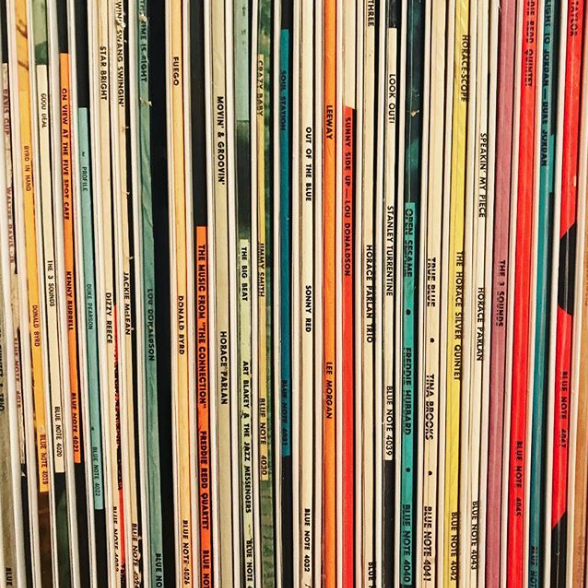 DGM: How did you get started collecting jazz records? jrock1675: I began collecting jazz records when I started to take an interest in jazz music itself. I received music lessons from around the age of 7, and became exposed to jazz in high school when I was 15 or 16 years old. I had a friend who was (and still is) a fantastic pianist who exposed me to Mingus Ah Um, Kind of Blue, and Brubeck’s Time Out. Those were the first three jazz LPs that I sought out. DGM: How many jazz records do you have in your collection? jrock1675: I have around 500 jazz records in my collection, but that number is constantly changing. I have focused on quality over quantity, so I generally only keep VG+ or better condition copies in my collection. DGM: How did you amass your collection and what’s your process for finding new records? jrock1675: I amassed my collection over the past 20+ years by initially purchasing solely at brick and mortar used record stores. I’ve actually never purchased a modern reissue of any jazz LP. I’ve always only sought out original pressings, but 20 years ago it was a lot more difficult to know what an “original” pressing actually was. Generally speaking, anytime I would take a trip, I would research any record stores in that particular city and then try to find gems wherever I may be. Over the years, some of my best finds have been in cities like New York, San Francisco, and Chicago when I have been in those places for work or vacation. In addition to brick and mortar stores, I have also amassed my collection by attending record shows periodically, and within the past ten years, I started buying online through eBay and Discogs primarily. The other way in which I’ve amassed my collection is by trading with other collectors, which used to only occur in person, but now happens over the mail as a result of contacts I have made online or through Instagram. In order to find records to add to my collection, I am always checking eBay and Discogs. There are four or five local shops that I frequent where the owners know me and will sometimes call me when they obtain a quality jazz collection. I have also had some good luck buying collections over the years. Those are more of a random occurrence, but I have friends who know I buy records and will tip me off if they hear about someone selling a large collection. Even if it isn’t jazz, I may buy it to either sell or trade in order to obtain more jazz records. DGM: Do you collect originals, reissues, or both? jrock1675: I only collect originals in their earliest known form. That’s part of the fun of collecting for me. First and foremost, I collect because I enjoy the music, but secondly, I collect because hunting for the earliest form of the release interests me from a historical standpoint. I have an anthropology background, so delving into the minutiae of these historical artifacts, from pressing details to jacket construction, really interests me. DGM: Do you prefer mono, stereo, or neither? jrock1675: I enjoy mono jazz recordings generally, but also enjoy stereo recordings when they are done well. Roy DuNann really mixed stereo well and I prefer some of the Stereo Records releases to those of the mono Contemporary Records releases (Contemporary actually released their first stereo LPs under a different label moniker simply titled “Stereo Records”, presumably as a way to more clearly market the new stereo form). 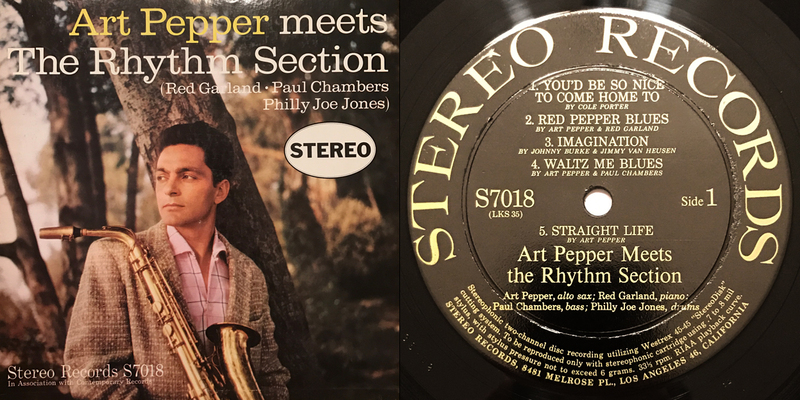 For example, Art Pepper Meets the Rhythm Section sounds incredible to me on Stereo Records. I have first pressings of both mixes and prefer the Stereo Records issue. 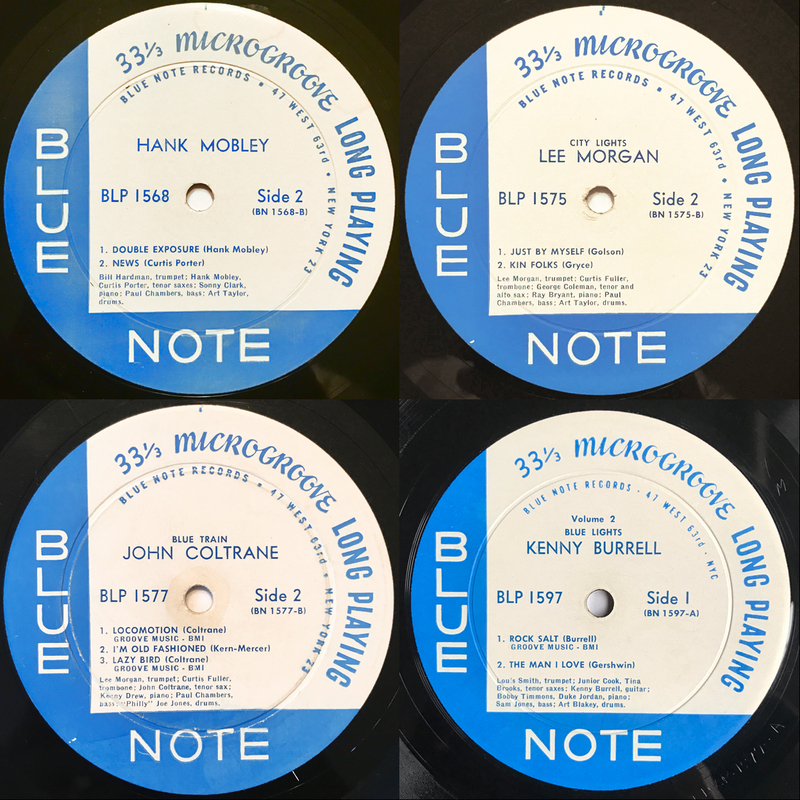 For Blue Notes, I prefer the mono mix prior to around catalogue number 4100. Starting after 4100, I feel like the stereo mix begins to sound as good to my ears as the mono. An example of a superbly mixed stereo release is Idle Moments in my opinion. The interplay of the instruments on that LP really works well in a stereo mix. I feel the same way about Horace Silver’s Song For My Father — also sounds fantastic in stereo. DGM: Who are some of your favorite artists and labels? Favorite artists: John Coltrane, Bill Evans, Charlie Mingus, Joe Henderson, Art Pepper, Lee Morgan, Jackie McLean, Booker Little, Hank Mobley, Sonny Clark, Sonny Rollins, J.R. Monterose, Kenny Dorham, Donald Byrd…I could keep going and going! Favorite labels: Blue Note, Prestige, New Jazz, Transition, Savoy, Riverside, Contemporary, Debut. DGM: What’s your favorite jazz record in your collection? jrock1675: Such a difficult question. From a pure enjoyment standpoint, my favorite jazz record is probably Sonny Rollins’ Saxophone Colossus. I don’t think I could ever tire of listening to that LP. It’s just perfect in my opinion and the original mastering by RVG is so in-your-face. It just encapsulates everything I love about listening to jazz music on vinyl. DGM: What is one of your most memorable acquisition stories? 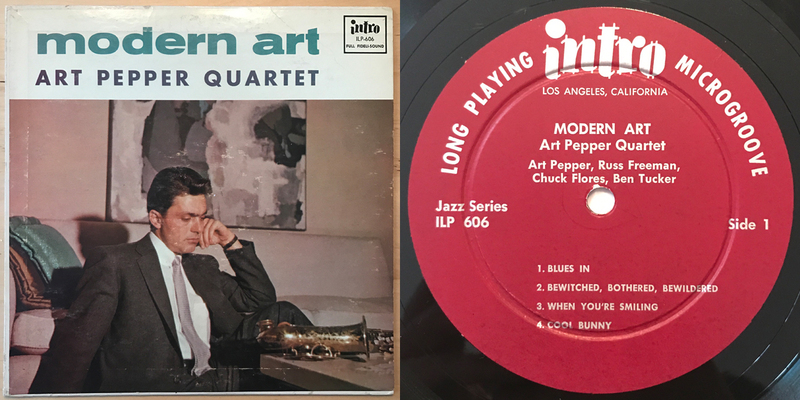 For the first story, I found out that one of my favorite local stores got a great condition original pressing of Art Pepper’s Modern Art on Intro Records, which was one of my holy grails. I’ve bought from this particular store for many years and the owner was willing to work a deal where I was able to trade a bunch of nice rock LPs along with several of the early Third Man Records Vault releases (Jack White’s limited release vinyl club) and received the Art Pepper in return. One of the ways that I determine whether to keep or trade an LP is whether I believe I will want to listen to that particular LP again in the future, and I came to the conclusion that it would be unlikely for me to do that with the Vault releases. It was a real thrill to leave the store that day with the Art Pepper in my hands and haven’t regretted the trade one day since. Ultimately, it pays to be a loyal customer of brick and mortar record stores because you never know what might turn up and maintaining a good relationship can only help. My second story involves buying a local collection from a delivery driver who actually dropped the records off at my office. The delivery driver obtained the collection from the original owner, who purchased the LPs in the ‘50s at a shop in my hometown that would have been only a few blocks away from my office today. 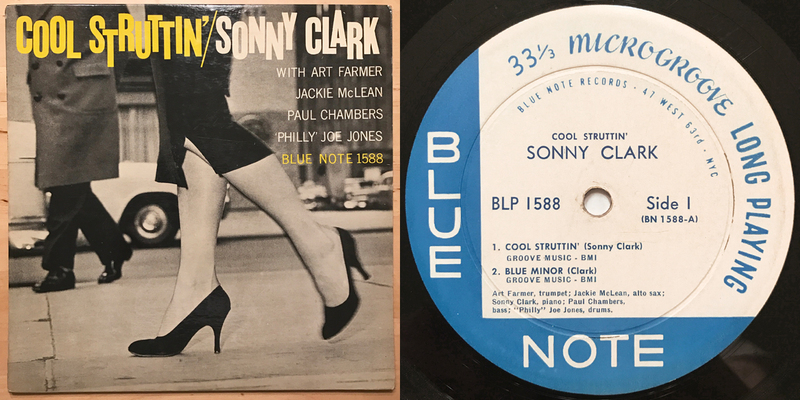 Among many great LPs (all of which were first pressings), the collection included copies of Blue Note releases Introducing Johnny Griffin (BLP 1533), Whims of Chambers (BLP 1534), 6 Pieces of Silver (BLP 1539), Swing and Soul (BLP 1566), and Cool Struttin’ (BLP 1588). Although I paid a good sum for the collection, it was a fraction of what I would have had to pay online, and I remember the connection to my hometown every time I spin these records. DGM: How do you feel about eBay’s influence on the collecting experience? jrock1675: eBay has helped collectors in my opinion in a number of ways. It has created visibility in the marketplace and has assisted with cataloging known pressing variations. It has also afforded collectors the opportunity to obtain very rare records that they may never see in their lifetime by digging at brick and mortar stores or at record shows. I know that there are a lot of negatives when it comes to overgrading by sellers and a general increase in prices across the board for desirable records, but I’d rather operate in a market with greater visibility than less. That’s a positive development in my opinion and, as with anything, knowledge is the key to avoiding mistakes. DGM: What are your thoughts on the past, present, and future of the jazz record market? jrock1675: Although the market is always changing, I feel like the most highly acclaimed sessions on labels like Blue Note, Prestige, and New Jazz will continue to rise in price for the top condition first or earliest pressings. I am also a collector of vintage watches and the key is originality and condition, along with being a timeless design from a well-respected brand. I feel like the same is true in the collectible record market. For better or worse, Blue Note seems to have the largest following among jazz collectors and I don’t see that waning anytime soon (and for good reason given how consistently incredible the sessions were). 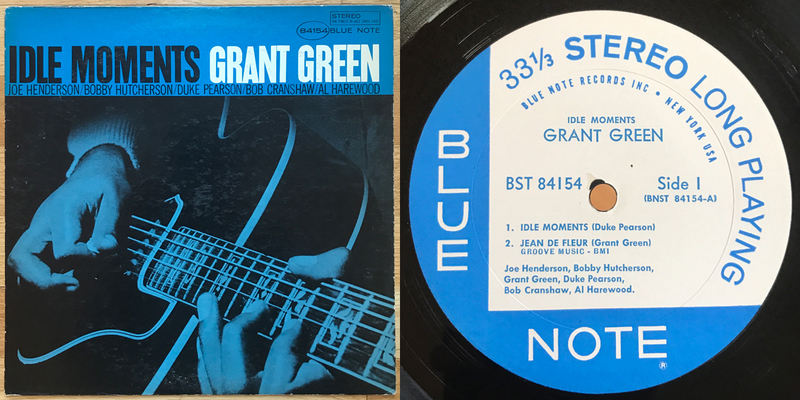 Even if their releases aren’t nearly as rare some of the releases on micro-labels like Transition, Debut, and Signal (although there are some truly rare Blue Notes, such as the deep groove version of Kenny Burrell’s Blue Lights Vol. 2 and Side 2 New York 23 label examples of BLP 1568, City Lights, and Blue Train), the demand for top quality, first press Blue Notes continues to rise. That’s just a fact given auction results over the past several years and the trend continues to creep higher. It’s a good thing for many of us who were buying these Blue Notes for $30 or $50 apiece 20 years ago, but makes these first pressings less accessible to newer collectors every passing year. DGM: Do you have any advice for other collectors? jrock1675: Do your research. Learn about pressing variations. Search for top condition examples. Don’t settle for “filler” copies. Seek out great music on labels like Savoy, which were recorded for the most part by RVG, but can be had for a lot less than Blue Notes or Prestige LPs featuring similar lineups of musicians. The same goes for Contemporary releases. Some fantastic music, including several wonderful Art Pepper sessions, recorded by the great Roy DuNann.